Mesa Arch is a famous structure in the Island in the Sky District of Canyonlands National Park above Colorado River near Moab in Utah, USA. Impressive photos show rugged canyon country in the distance framed by a close-up view of the photogenic arch. Some of the best photos are taken at sunrise when the arch glows red and orange. This image belongs to the travel and nature stock photo library. This stock photo of Sunrise at Mesa Arch is available for licensing for commercial and editorial uses including websites, blogs, books, magazines, brochures and advertising. Restrictions may apply for images which contain third party copyrighted material or sensitive subjects. Photos of artwork are for editorial use only. 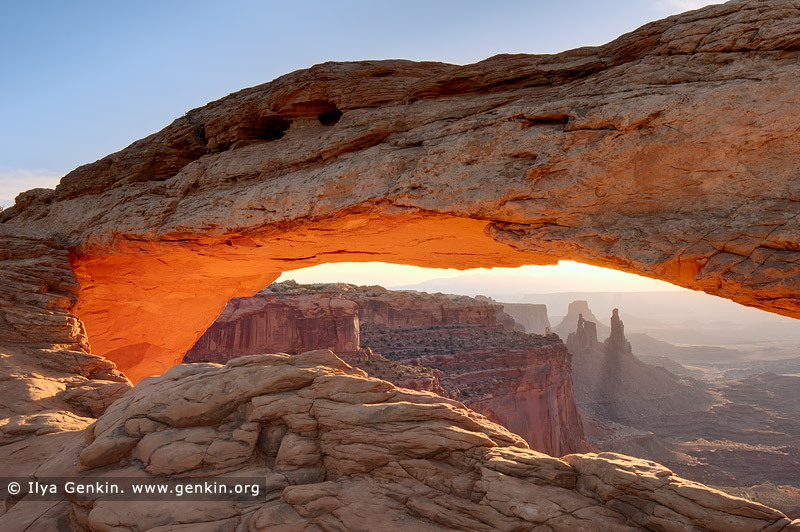 This image id CANYONLANDS-NATIONAL-PARK-UTAH-USA-0003 of Sunrise at Mesa Arch, is copyrighted © by Ilya Genkin. This is not a public domain image.